Feel free to test, brothers and sisters. I implemented some enhancements suggested here, including removal of Trolltech junk. Fixed bugs #76, #75, #82, #79, #85 #78, #92, #93. Settings/database can now experimentally be exported/imported. Added Swedish localization (thanks to Åke Engelbrektson). Parent item is now selected when adding new category/feed with that parent pre-selected in feed view. Message date/time format is now changeable. Last edited by skunkos on Fri Nov 07, 2014 10:41 pm, edited 1 time in total. The app works great and so is the new feature that allows us to get rid of the Trolltech leftovers. Thank you! Stealth field should be updated now, too. Yes, this was in fact a feature, not a bug. It was comparing those strings "2.0.0.2" and "2.0.0.3" and if they were not equal, then it was considered that you do not have latest stable version installed + the file announcing 2.0.0.3 was not edited for 2.0.0.3 yet. Anyway, I fixed this for next release, now it will report new version when they are really newer than installed. New version 2.0.0.4 is out. Database is now correctly restored when using SQLite memory databases. Layout orientation of message list/viewer is now changeable via "View" menu (bug report #98). Sort order/column in message list is now persistent (bug #97). Inline searching in feed/message list is now case insensitive and more polished (bug report #84). Items in feed list (categories and feeds) now can be re-arranged via drag-drop functionality (issue report #91). Tray icon now displays blue number of unread messages if any of those messages is newly downloaded from online feed (enhancement #87). Fixed issue request #95: items are now permanently hidden (not deleted from database) when "deleted" from recycle bin. Issue request #95: moreover custom incremental ability to update database schema was added to keep RSS Guard 2.0.0.4+ fully compatible with previous releases. Incremental algorithm supports both database backends. New version 2.1.0 - maintenance. - Fixed bug #105, #103. - Embedded web browser supports printing of its contents, feature is accessible via web browser context menu. - Embedded web browser now displays navigation toolbar even in message preview mode/newspaper mode when user loads external links. skunkos wrote: New version 2.1.0 - maintenance. New version 2.2.0 is out. Fixed issue #53 - removing of duplicate messages. Feature is available globally in "Settings -> Messages". Fixed issue #100 - saving HTML web pages. Completely new downloader (see menu Tools -> Downloads) forked from original Qt examples. 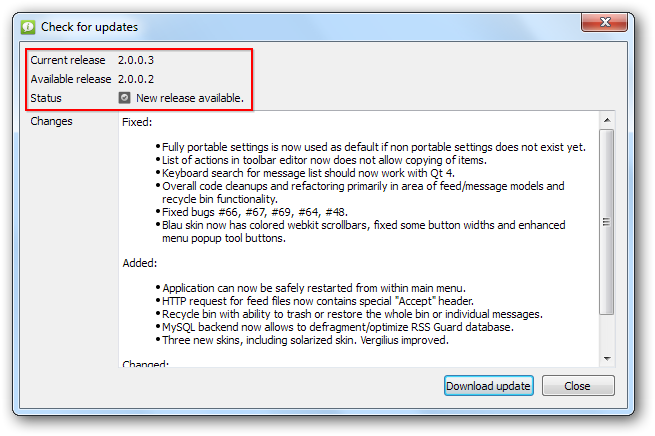 Updater now displays full changelog. skunkos wrote: New version 2.2.0 is out. Quite a few new versions from 2.2.0 are out. Key used for proxy/feed password coding is now stored in separate file. This file lies in the same directory as configuration file. If your use password-protected proxy/feeds, then make sure that NOBODY gets access to that file and your DB file in the same time. Notifications on Linux now support D-Bus "org.freedesktop.Notifications" service. User must have enabled "modern & fancy notifications" for this to work. If D-Bus service is not available, then feature falls back to RSS Guard custom popup notifications. Size of downloaded website artifacts is now not hidden by progress bar. Fixed some memory leaks which might appear when adding/editing categories/feeds. User selects some feeds with unread messages, reads them all. User switches to another feed. Previously selected feed (now has no unread messages) is now hidden. Note that this feature also works when you e.g. mark message(s) as read/unread or when you restore some messages from recycle bin. Also when feeds are updated, then filter is invalidated. Password in feeds & proxy & MySQL are now saved in encrypted form. This means that all passwords from RSS Guard older than 2.5.0 are lost!!! Set your passwords again. Used encryption scheme is meant to only make sure that passwords are not stored in DB/settings in plain form. It is not meant to protect your passwords in any broader way. Attacker can exploit your passwords if he really wants. Fancy & modern popup notifications (turned on by default). Enhanced information in download manager. Added ability to change font for internal message viewer. Updated URLs of some Adblock subscriptions. (Windows only) Updated bundled Qt runtime to versions 4.8.7/5.5.0. Pre-builded binaries use Qt 5. Although this results in larger installation files, this is good for future, because Qt 5 is newer and has better support. Adblock subscriptions starting with faulty " [Adblock..."] are now correctly loaded. Browse button in 'Downloads' section of settings is now correctly disabled when needed. Icon cache is now automatically cleared after most of application is loaded. This should save some memory. Added support for Google auto-suggest API. Just type your phrase in internal web browser location text box and Google will help you out. Source code now uses QStringLiteral/QLatin1String class for character literals. Internal message previewer is now cleared only once when switching feeds. Database cleanup tools now do support "shrinking" in in-memory databases, althouth it is bit hacky. Google suggest API now prevents completion if ENTER in address textbox is hit. Double-clickin on message now results in opening source article in mini web browser. RSS Guard is now able to export/import feed/category icons to/from OPML 2.0 files. Localizations now load their titles for localization list automatically. All feeds are by default checked when exporting/importing them. Message previewer now displays MIME type of all podcasts too. This MIME type is also stored in DB. Ability to fetch only new icon for feed from its online source. Message view now automatically scrolls to selected message when changing filter string. Some small memory footprint enhancements. Marking feed(s) unread now correctly marks also selected message unread. Threads for feed updating are created only when really needed. Reworked DB initialization scripts which allow to use OPML to do initial feed population. Titles and descriptions of feeds are now fetched correctly in feed add/edit dialog. Enhanced downloading of feed icons. Now combines Google API along with the actual links obtained from feed XMLs. New constructs on source code level. Many minor fixes, mainly code cleanup and refactoring. Better format for logged messages. Logging to file is possible via "rssguard 2> log.txt" command. Full support for podcasts (issue #81). Supports RSS 2.0 podcasts and ATOM 1.0 podcasts. In ATOM, RSS Guard is able to fetch multiple podcasts per message. Podcasts are displayed as additional URL addresses in message preview panel. skunkos wrote: Quite a few new versions from 2.2.0 are out. -the feature is for mysql database, not sure if sqlite is applicable. -the offline mode will download/save the original link, maybe plus 1 level for images(to get original images) and remove the ads, social fluff. -the offline mode will run in the background. the offline mode is for user who has no permanent internet connection/charge per mb usage/capping. Please, report this feature request to here.